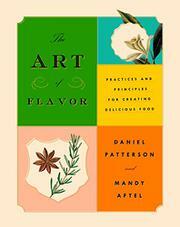 A James Beard Award–winning chef teams up with a perfume alchemist to reveal how food gets its flavor and how that flavor can be improved. Good food isn’t just a matter of taste; apart from the visual component, the presentation on the plate, it’s also a matter of the nose.” Write Patterson (Coi: Stories and Recipes, 2013, etc.) and Aftel (Fragrant: The Secret Life of Scent, 2014, etc. ), “that’s why experienced cooks spend as much time smelling as they do tasting.” The authors go on to suggest that one component of being an experienced cook is to have logged enough time at the stove that recipes become suggestions rather than blueprints: a recipe can’t take into account the quality or condition of its ingredients, but “a good cook can adapt...and produce something delicious.” Another component is knowing how to complement an ingredient with flavoring to bring out its best. For example, a nondescript butternut squash comes to life with some ginger, an apple, some vegetable stock, and especially some butter (“fat fixes flavor”). The authors propose a set of common-sensical rules, one of which reads, in its entirety, “contrasting ingredients need a unifying flavor.” Cooked cauliflower lacks punch but comes alive with some dry-roasted cumin. But dry-roasted cumin doesn’t pair well with butter until the butter is browned, when “rich and meaty aromatics are created, much like when you brown meat, and the browned butter stands up well to the strong spice.” Patterson and Aftel don’t shy from heavy-duty science and densely packed concepts, invoking terms such as “cinnemaldehyde” and “flavor memory,” the latter of which they gloss as “the sensory database of experiences that you’re constantly compiling.” From the suppressive power of salt to the best way to cook steaks while preparing multiple other dishes, this zesty book offers some useful tip on every page. A welcome complement to the likes of Brillat-Savarin and Harold McGee and worthy of a place in any cooking enthusiast’s library.